The College of Business at ACU » College Field Trips; AKA Networking Opportunities! College Field Trips; AKA Networking Opportunities! Field trips aren’t just for elementary school students. 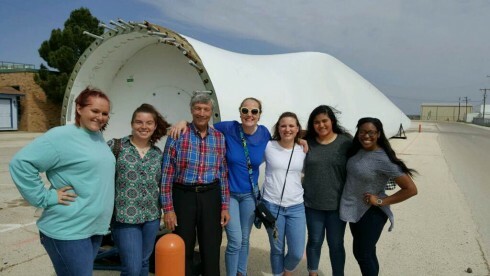 Many professors find taking students on field trips gives them insight on careers and industries they may have never known about, as well as building networking opportunities for students and employers at the sites that they visit. On Wednesday, March 30th, Dr. Malcolm Coco took 7 of COBA’s Human Resources track students on a field trip to the TSTC campus in Sweetwater, Texas. Their guide for the day was Hannah Love, Associate Vice Chancellor for Human Resources. Ms. Love has responsibility for the HR function for eleven of the TSTC campuses located across Texas. She presented to the students on the functions of HR and the challenges faced by having so many different campuses located in eleven different geographic locations. She also discussed the challenges TSTC faces in providing training programs for businesses across the state of Texas tailored for their individual company needs. The group enjoyed a tour of TSTC’s wind turbine and electromagnetic systems technology training facility. We’re grateful to TSTC for their hospitality and to Dr. Coco for getting the students out of the classroom and into the working world. Opportunities like this enable our students to grow and develop as well as connect with potential employers as they pursue their career goals.